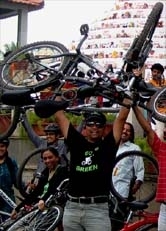 Bangalore CriticalMass 28 July 2013 - GGI-Group size: 4000+ Professionals, Increasing on day to day basis, Come & join us 2 serve Mother Nature. What a wonderful ride .. Blessed with cloudy weather. 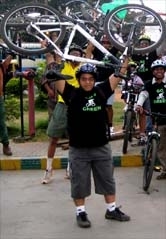 The ride started from Bangalore Press Club, Totally 63 Cyclist participated in Bangalore Critical Mass which was scheduled on Sunday for the first time in history. 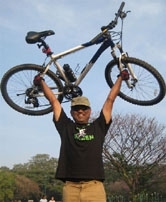 Among this the youngest participant was 80 years by name “Janardhan Sir” and the eldest person was 6years old by name “Pavan” who joined us along with his parents cycled all along with us with a single speed geared cycle. Though initially we were stopped by 2 police man but while they reported about us to their Seniors who gave us a green flag..  started by 7:50am peddled through the following route.. Totally the ride covered was 18 Km’s and every one enjoyed… Thanks for everyone for making up for this event and showing up their support..
For the next Critical Mass Sunday,25Aug13 try and get one more cyclist along with you so that we can double our strength.. Please TAG your self and share these snaps with your friends.